Cheddar’s Scratch Kitchen, formerly known as Cheddar’s Casual Cafe by most Americans, is a casual restaurant chain based out of Irving, Texas. The brand boasts made from scratch meals that are wholesome, delicious, and comforting to diners of all ages and walks of life. Are you interested in finding a Cheddars near you? Simply browse Cheddars near me on the map below and find a list of Cheddar’s restaurants located in a close proximity to you. Need a bit more information on this delicious made from scratch brand? Read on for interesting facts, trivia, and information on this delicious chain! What year was Cheddars founded? If you’re searching Cheddars near me, then you’re hoping to find a delicious made from scratch meal at a cost that won’t break the bank. Do you know the history of this unique chain? Cheddar’s was officially founded in 1979 by Aubrey Good and Doug Rogers in Arlington, Texas. Good and Rogers believed that when a meal was prepared and cooked fresh for the customer that the food tastes better and leaves a mark on the customer that goes far beyond their time at the restaurant. The duo realized that this took time and patience, thus every restaurant begins slow cooking their meats and baking their breads early in the morning. Cheddars was an immediate hit in Texas. The chain expanded to include 10 locations by 1995, with continuous growth up until the present day. By 2003, Cheddar’s was generating more than $150 million in revenue from 42 restaurants in 13 states. To grow the restaurant, the team brought in Brazos private equity partners to invest and help expand. By August of 2006, the company had generated more than $245 million in revenue from more than 55 restaurants in 15 states. In August 2007, the company went ahead and recruited Kelly Baltes from Darden Restaurants to serve as CEO of the company. Today the company has more than 135 company owned and franchise locations in 23 states. 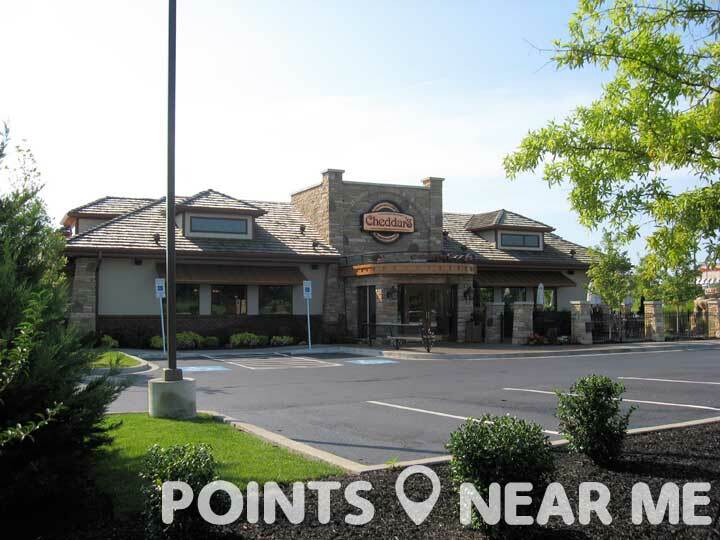 Every Cheddar’s boasts a classic stone exterior and a warm comforting atmosphere. True or false: The name Cheddars was decided by a group of school children. Any restaurateur knows that the name can definitely make or break the overall establishment. While coming up with a name is a task that many dole out to marketing agencies and professional firms, Cheddars took a very different approach. Consider this as you search Cheddars near me. When initially shopping around for names for their new concept restaurant, Rogers and Good decided to go ahead and ask a group of schoolchildren what they thought. The children were presented with a few options, one of which was Cheddars. The children favored the fun name Cheddars over any other and the brand officially adopted the name as their own. The rest is restaurant history! Nowadays, Cheddar’s is well known for being a from scratch kitchen with an emphasis on fresh ingredients and home cooked meals, but at the beginning, Cheddar’s was simply known as Cheddar’s. Sure, the brand has always done the made from scratch thing, but the name has not been static. After starting out as simply Cheddar’s based on the suggestion of some school kids, the brand later changed its name to Cheddar’s Casual Cafe. The name stuck for quite awhile but underwent some changes in 2015 in an attempt to rebrand the restaurant. The name became Cheddar’s Scratch Kitchen in an attempt to emphasize the fresh aspect of their menu. In an over saturated restaurant market, setting yourself apart from the pack is highly important. Not only is Cheddar’s one of the only chain restaurants in the US that makes its food from scratch daily, but it’s one of the few restaurants that has kept prices reasonable enough to grant the average American access to a delicious home cooked meal. As you search Cheddars near me, consider this brand’s commitment to quality, freshness, and comfort fare to be one of it’s most identifying qualities. Few chain restaurants can boast a Zagat rating, but Cheddars can! When was the last time that you visited a national chain and were treated to Zagat quality food. In 2012, Zagat bestowed four prestigious honors on Cheddar’s: the top full service restaurant chain, the top overall American cuisine chain, top rated food, and top rated decor and facilities. The brand has also earned top honors from Consumer Reports and Nation’s Restaurant news. While many chains struggle to appeal to diners from coast to coast, Cheddar’s has managed to appeal to a broad audience of folks, even those who aren’t privy to the Southern American style cuisine that the brand is best known for. As you search Cheddars near me, consider just how much these honors say about the quality of the chain itself. When eat at Cheddars you’re not only getting high quality food, you’re being treated to a clean and friendly environment.